Keep pins and needles at your fingertips. 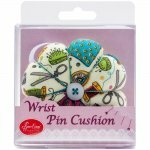 Great when pinning patterns or removing pins while sewing. Large flower shape pin cushion with elastic wrist band.